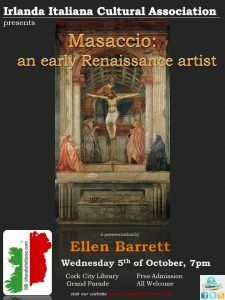 We would like to invite you to attend this special Italian Art event where Ellen Barrett will talk us through the proto-Renaissance artist Masaccio. This talk will focus on the way Masaccio profoundly influenced the art of painting in the Renaissance. He transformed the direction of Italian painting, moving it away from the idealizations of Gothic art and presenting it as part of a more profound, natural, and humanist world. in Cork City Library at 7 pm.